Synopsis: Ever been addicted? Most people have at some point, but it was different for these three. They'd become addicted to their respective sports: hockey, lacrosse and rugby. What's wrong with that? Nothing, apart from the fact they're DRAGONS, living in the present day, in a world in which dragons disguised as humans have infiltrated the human race at almost every level, to guide and protect them. Three young dragons, a master mantra maker, and a complete dragon stranger with more than a little history attached to him, become caught up in an evil plot by a sinister newcomer to steal a precious commodity, vital to the dragon community. How will the reluctant hero and his friends fare against an enemy of his race from far in the past? Fascinating insights into the dragon world are interspersed throughout the book. Ever wondered how dragons travel below ground at almost the speed of sound? Or how they use magical mantras to transform their giant bodies into convincing human shapes? In an action-packed adventure that features both human and dragon team sports, you'll learn the true story of George and the Dragon, get a dragon-like perspective on human social issues and insight into what to do if you meet a giant spider grinning at you when you're wearing nothing but your smile! You'd be flamin' mad to miss it. Review: This book starts off by throwing you right into the action. Your heart will race in anticipation, and you won't want to put the book down as you're pulled deeper into the magical world of dragons. Magic, intrigue, and the timeless battle between good and evil all combine to create an unforgettable tale of heroism. it would be little surprise to find him, in his free time, somewhere on the Dorset coastline, chasing over rocks and sand in an effort to capture his wonderful wife and lovely kids with his camera. 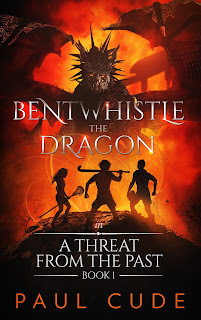 Paul Cude is also the author of the Bentwhistle the Dragon series of books.